…for campus or regional communication and as community building tools at the grassroots level. We'd like to post more from them for readers to learn more about campuses and workplace conditions in other parts of the country. Not everything changes and many traditional ways are as good as ever. Smart change is keeping what works, using new tools to share and make it better. Board member Peter D.G. Brown is also President of the SUNY New Paltz UUP Chapter and edits its award winning newsletter, The Bullhorn. Peter shares this link to the September Special Issue noting that much of it is "devoted to contingent issues, as usual. 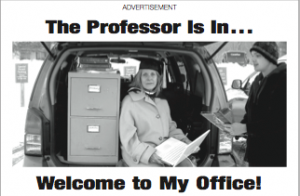 I'd like the p. 4 article on Lavallee to get wide exposure, since he is being showered with money, while the campus administration cries poverty when it comes to increasing pay for adjuncts." Read and compare Peter's articles on Lavallee and New Paltz adjuncts posted below. But don't miss out on the rest of the issue or the Mayday Declaration (formerly Mayday $5K) for a living wage and basic workplace rights for adjuncts. Sign it. Share it. …are they precursors of change or another round of promises? Will momentum continue to build, moving toward a tipping point, a major swerve? I'm still working on another change post, building off the last. The concept no sooner gels than something pops up to change it. Change is like that. This is not about change but not quite not about change. Starting as a gap fill post, it has come to feel more like watching for the wave. With a month and a half to go, a new Campus Equity Week page launched. What did Mission Control used to say? We have lift-off. Later than advised but well ahead of the 2009 and 2011 late starts. From its inception, CEW was as a genuine grassroots effort. Yet without the focus of a dedicated home base and a point person designated to round up, report, announce and share resources, it was not thriving as it had earlier. Not that anyone wanted to see it go, but there was no concerted effort for a large scale push. Pockets of activities persisted on scattered campuses.